An idea so crazy it just might work. 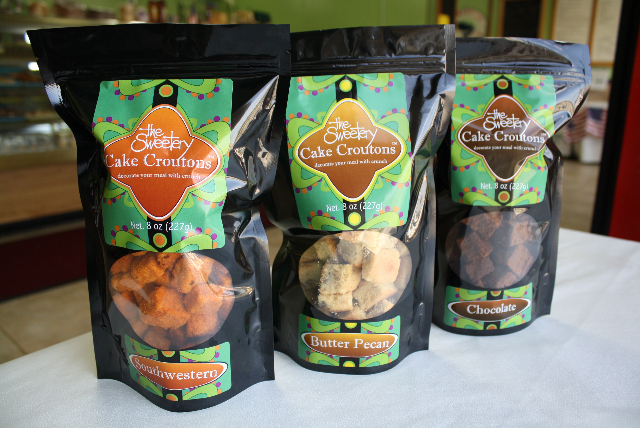 The Sweetery in South Carolina makes Cake Croutons in five flavors. Cake Croutons from The Sweetery. Photos by Bakery Boy. 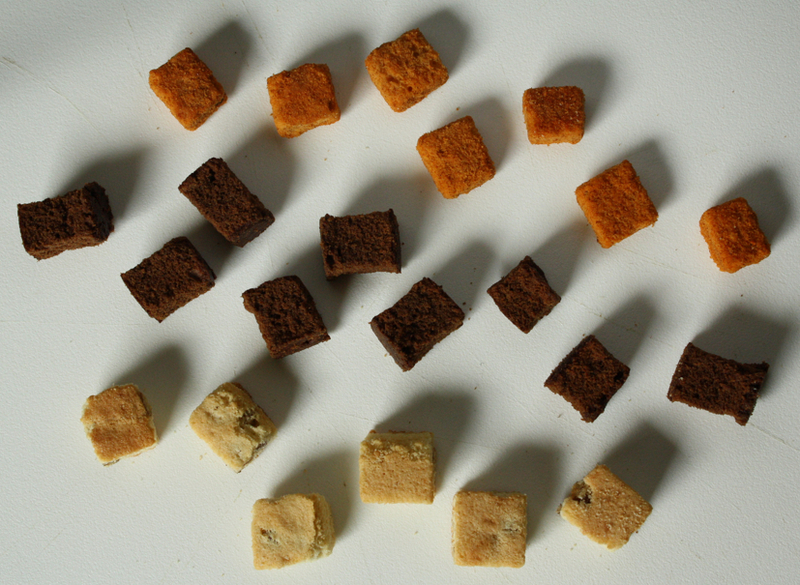 Who needs dried cubes of bread when you can have dried cubes of CAKE instead? And these Cake Croutons aren’t just for topping salads anymore. 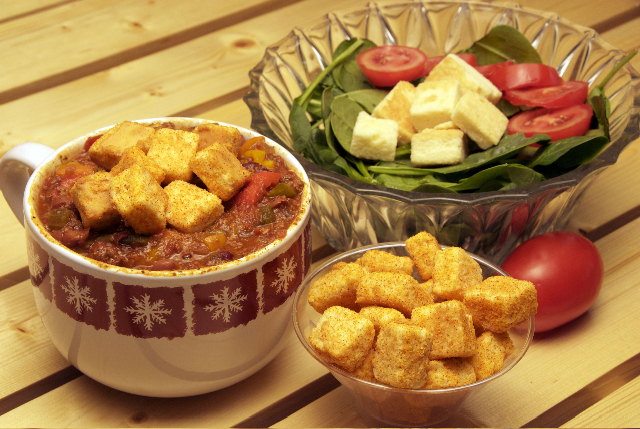 Cake Croutons add a sweet crunch to salads, soups, ice cream, dips, pie crusts, grilled meats, and more. 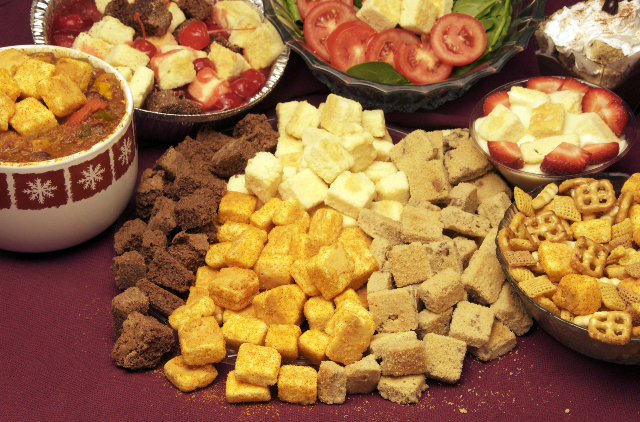 Cake Croutons in regular production are Original, Chocolate, Butter Pecan, Cinnamon Espresso, and Southwestern, the latter dusted with hot chili powder. Except for the spicy southwestern version, each adds a sweet crunch in places you might not expect to find a sweet crunch. 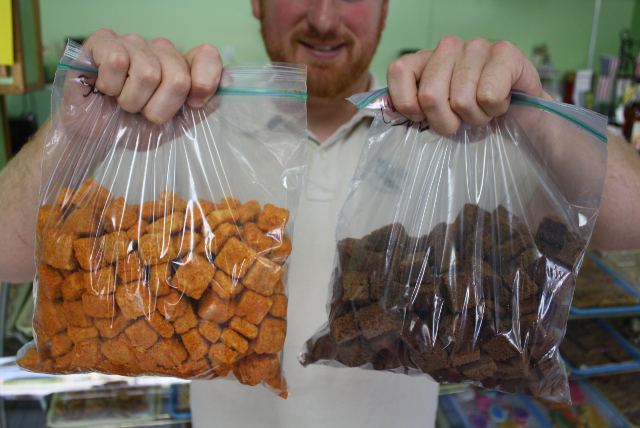 "Inventing new treats such as or Cake Croutons makes this job fun," says baker Ryan Jarahian of The Sweetery. Photo by Linda Askey of http://www.lindaaskey.com. And then there were...fewer: These Butter Pecan, Chocolate, and Southwestern Cake Croutons were all that remained near the end of my photo shoot. A BAKERY BOY CONFESSION I brought home three kinds of Cake Croutons—Chocolate, Butter Pecan, and Southwestern—and the challenge was to NOT eat them before photographing them. Quite a few didn’t make it through the photo shoot. There are too many to fit in the frame anyway, I reasoned, so I culled out (yum) any slightly imperfect ones. Then I culled out (gulp) a few perfectly perfect ones. Then I decided to go with a smaller grouping (crunch). Then I zoomed in on what remained (mmm). When I finally got the shot I wanted, the rest disappeared in seconds (ahh). I guess it better be the shot I want, because it’s too late now! 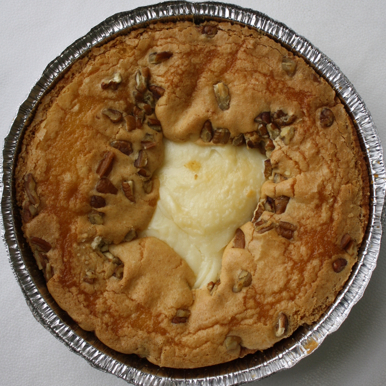 TO ORDER Go online to www.thesweetery.com to explore the wide variety of cakes, pies, cookies, and more that The Sweetery makes, then call 864-224-8394 or toll free 800-752-1188 to place an order. The base price of a 8-ounce package of Cake Croutons is $4.25. Tell them the Bakery Boy Blog sent you. Try the Uggly Cake. What it lacks in good looks it makes up for in great taste. Uggly Cake. Photos by Bakery Boy. The name alone makes us curious. We want to see if something called an Uggly Cake really is ugly. So here’s one for your inspection, a genuine Uggly Cake (the extra “g” added for trademark purposes) from The Sweetery in Anderson, South Carolina. 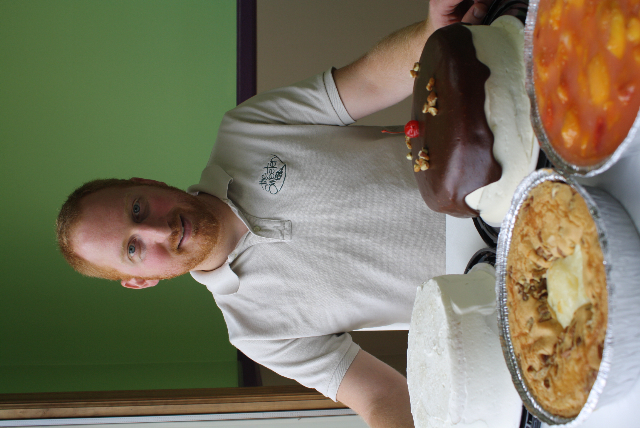 Ryan Jarahian with (clockwise from left) Mimosa Cake, Banana Split Cake, Peach Delight, and Uggly Cake. “And he’s just talking about the regular Uggly.” Jane adds. “We also make Chocolate Uggly Cakes and Key Lime Uggly Cakes.” Price: $9.40 each. BEYOND UGGLY The Sweetery is no one-trick pony of a bakery, though. Jane has been steadily building her business for 25 years, starting in a home kitchen not far from today’s retail location. 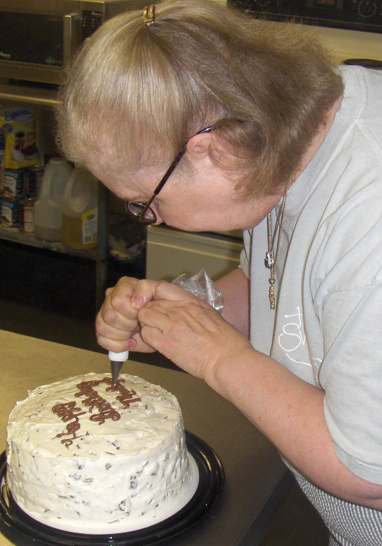 A vigorous mail-order operation (you can get an Uggly Cake home-delivered for $26) helped the operation grow beyond her town in northwestern South Carolina. 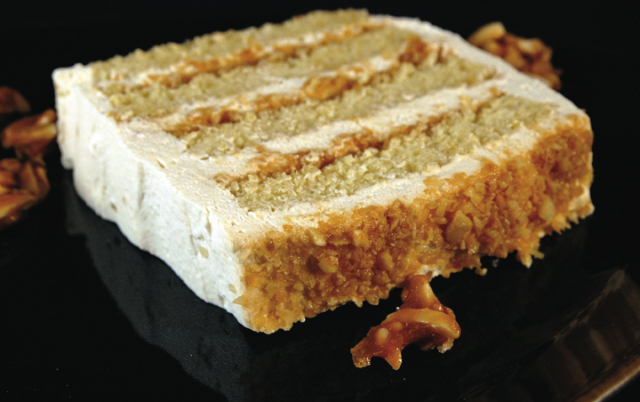 The extensive lineup boasts richly frosted layer cakes including carrot, coconut, German chocolate, Italian crème, red velvet, chocolate peanut butter, caramel, and more. The strawberry layer cake is the best selling item year ‘round. 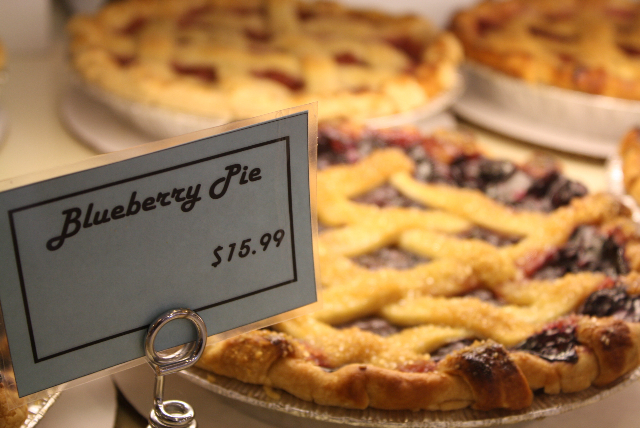 Among the pie selection, standouts include those with pecans from local groves. There are also pound cakes, cheesecakes, brownies, and at least two-dozen kinds of cookies in the showcase. The place goes way beyond Uggly. Jane Jarahian started her bake shop at home 25 years ago. Photo courtesy of The Sweetery. NO JOKE Did you hear the one about the biologist, the factory worker, and the potting soil dealer? That might sound like the start of a silly joke, but it describes the trio behind this family business. 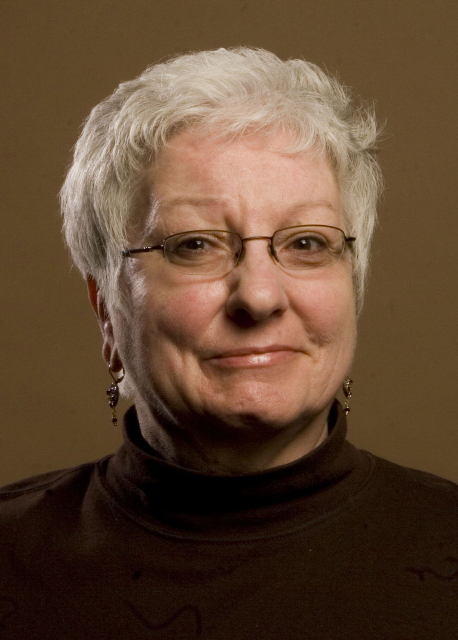 Jane worked in sales at a plastics factory before it closed. A self-taught baker with a passion for food, she started baking cakes at home and selling them to friends and restaurants, and when the orders outgrew the house, she moved first to a small shop nearby and then to a larger shop next door, adding staff as needed. Her son Ryan graduated in 1998 from The Citadel in Charleston, became a wildlife biologist, and worked at the Shark Reef Aquarium at the Mandalay Bay Hotel & Casino in Las Vegas while also conducting research on desert tortoises for the University of Nevada, the U.S. Bureau of Land Management, and the U.S. Geological Survey. He left all that to come home and bake cakes with his mom. Jane’s husband, Steve Jarahian, an an executive at Oldcastle (the potting soil company) as well as an expert cookie maker. Ryan's Mimosa Cake tastes "like a drink that you eat." 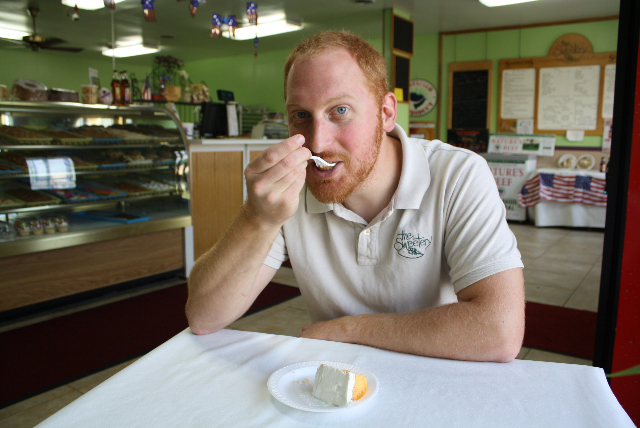 "We all enjoy inventing new treats," Ryan says of his baking family between bites of Mimosa Cake. 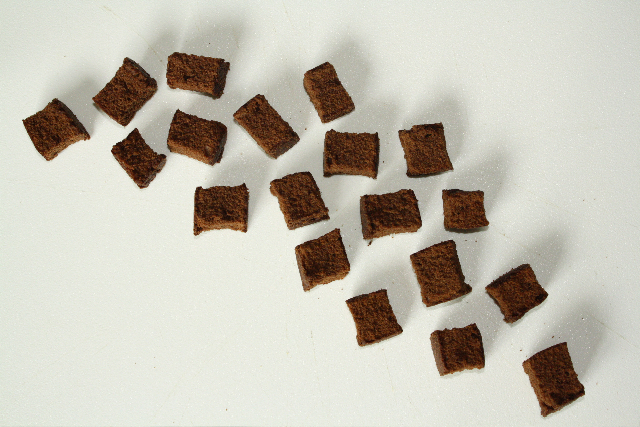 Sweetery croutons made of cake instead of bread find many uses. Photo by Linda Askey of lindaaskey.com. COLLEGIATE CAKES The Jarahians had a little college-level help with another Sweetery innovation: Cake Croutons (click here to see separate article). “An intern from Clemson University was working here and overheard us talking about new product ideas for a trade show we were going to,” Ryan explains. “We were looking for something that might go over well with a younger audience. She took a few cakes with her to a culinary class, the students brainstormed, and what they came up with was the idea of croutons made of cake. We took it from there and ran with it.” Produced in five flavors—original, chocolate, butter pecan, cinnamon espresso, and southwestern—the toasted sweets can be used to garnish salads, top ice cream, rub meats for grilling, crush into pie crusts, drop into soups, and more. ON A MISSION Jane is currently president of the South Carolina Specialty Food Association, an organization that promotes authentic foods and supports independent farmers, producers, retailers, and other small businesses. 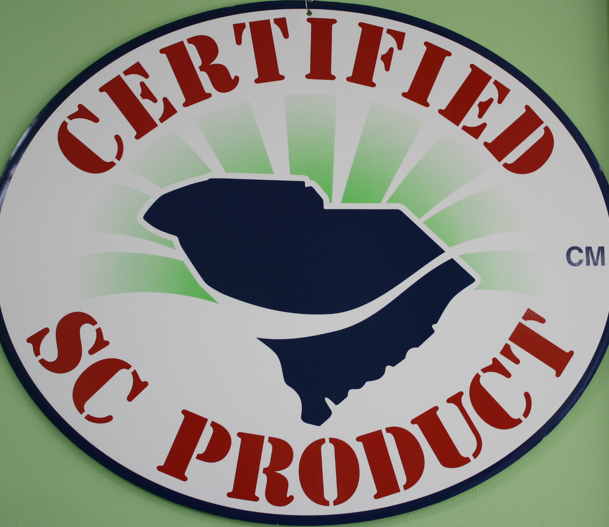 Working closely with the South Carolina Department of Agriculture, its nearly 140 members produce everything from cakes to chocolates, wines, flour, pet treats, barbecue sauces, pecans, peaches, honey, tea, crab cakes, sausages, dairy products, and more. “We’re all about eating real, fresh, local foods,” she says. HOURS Mon-Fri 8 a.m.-6 p.m.; Sat 9 a.m.-3 p.m.
SPECIAL THANKS Friend and garden writer/photographer extraordinaire Linda Askey (www.lindaaskey.com) contributed the photo of Cake Croutons on salad, on chili, and as snacks. 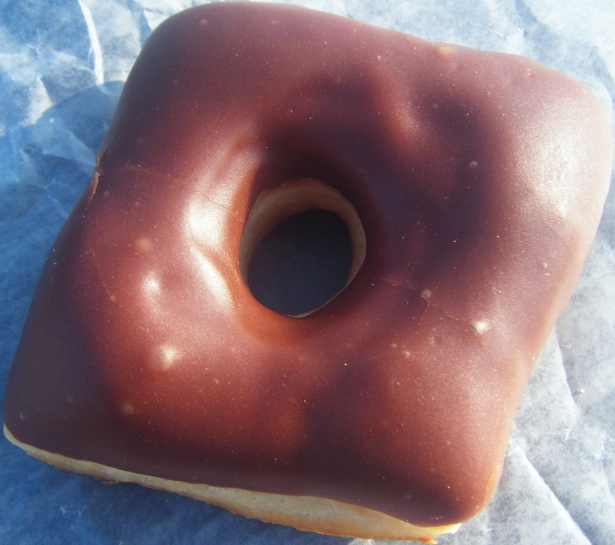 If the D Square Donuts slogan “four more bites” doesn’t bring you around, the generously applied fillings and toppings will. 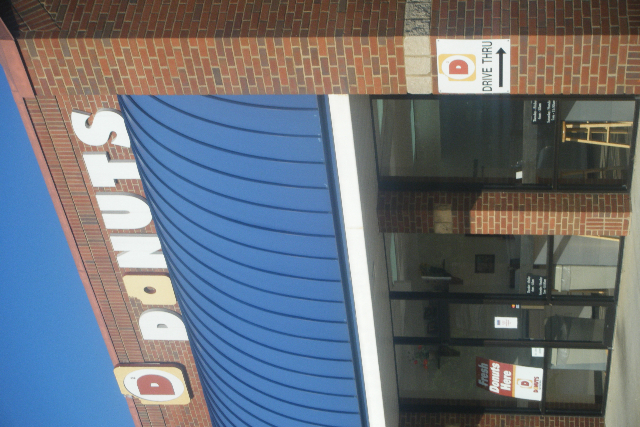 D Square Donuts earns its name with mostly four-cornered treats. Photos by Bakery Boy. Fillings in generous proportions add flavor and moisture to the yeast-raised donuts, among them apple, strawberry, blueberry, lemon, Bavarian crème, chocolate, peanut butter, white crème (like wedding cake frosting), and key lime pie (with crumbled graham crackers coating the outside). 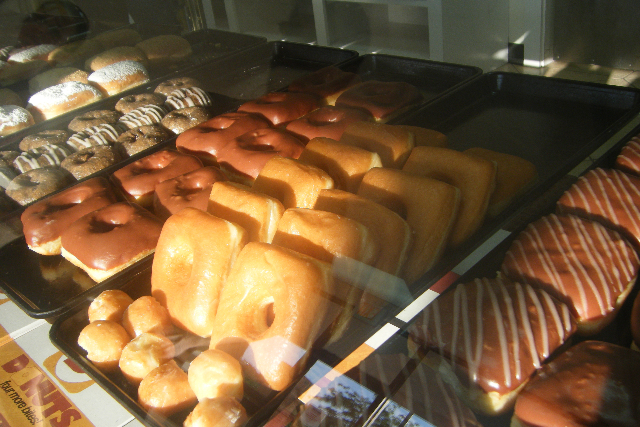 Honey buns, fritters, donut holes, and yes even a few traditional round cake-style donuts line neighbor trays. Auburn University student Nicole Carlson shows off Tiger Stripes and chocolate-iced donuts. A few round donuts (cake style) mingle with the namesake squares. GET A ROUND You can still get round versions if you want. 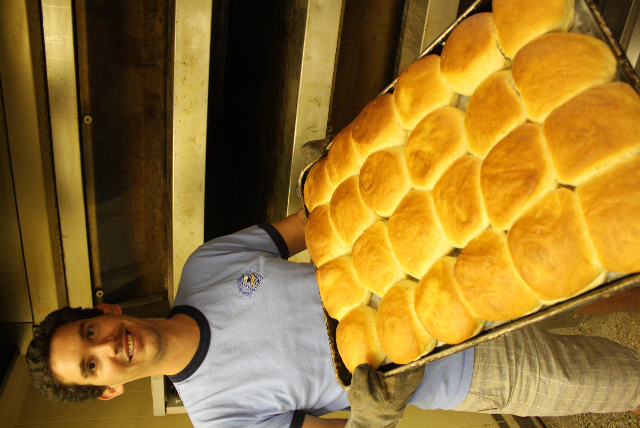 “Only the yeast donuts are square because they’re cut out of a rising dough,” Dennis says. 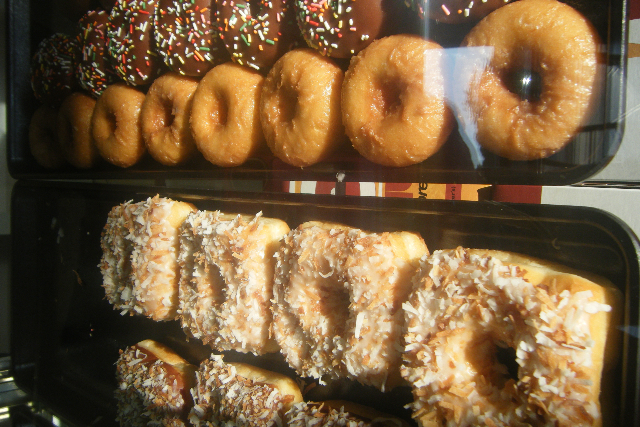 “Cake donuts start out as a batter and are round because they’re squirted into the fryer already that shape.” Regular, chocolate, plain, iced, rolled in cinnamon-sugar, striped with icing, dusted with powered sugar, dotted with colorful sprinkles, and other variations satisfy donut purists who are too hip to go square. Only open 4 hours a day, D Square still needs a drive-through lane to keep inevitable lines moving. Home bakers feel like stylish pros using bakers’ peels and dough bowls crafted by Tom Sternal of Elkland Handwerke. 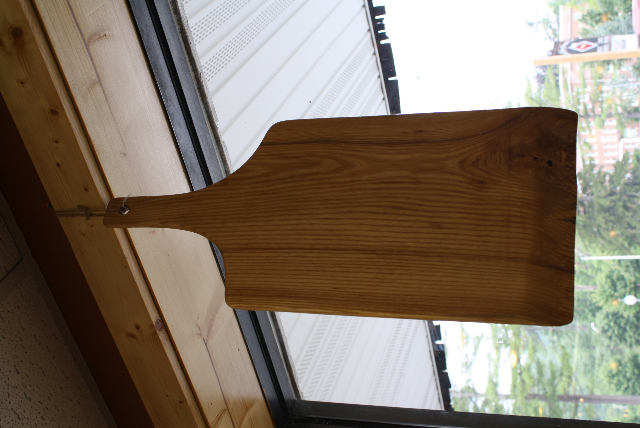 I found this Elkland Handwerke baker's peel at Stick Boy Bread Co. in Boone, NC. Photo by Bakery Boy. If you’ve ever seen a baker use a big flat board with a long handle to shovel baked goods around in a hot oven or move them to cooling racks, then you know what a “peel” is. Peels used by commercial bakeries—sometimes six feet long and three feet wide—won’t fit easily into your home kitchen or oven, but scaled-down versions work fine and even look cool hanging on a peg between uses. Don’t settle for the cheap metal kind you see at pizza joints. Get one of the handcrafted beauties Tom Sternal of Elkland Handwerke makes out of hardwood trees he salvages around his home in the Blue Ridge Mountains of North Carolina. From this slab of hardwood Tom Sternal will sculpt a beautiful dough bowl. Photo by Robert Stein of http://www.robertsteinphotography.com. Devoted to recycling and determined to waste nothing, Tom turns leftover pieces into artful peels, bowls, cutting boards, spatulas, ladles, letter openers, and more. He even makes kindling and charcoal from splinters and sawdust. A baker's peel, scaled down for home use. Photo by Bakery Boy. BAKERS’ PEELS As a kid I marveled at the quick agility on display as my father, grandfather, uncles, and other bakers wielded giant peels to transfer hot loaves from oven to cooking rack. When I first noticed ushers at church working their long-handled baskets in a similar fashion at collection time, I thought they were all bakers too. Now I finally have my own smaller peel to use at home, a thin slab 12 inches wide and 24 inches long counting the slender handle, shaped from a single piece of tulip poplar. “I use whatever kind of wood I have leftover from bigger projects,” Tom says. “Poplar, cherry, oak, walnut, maple—they all have wonderful grains that show really well when they’re milled just right.” Price range: about $20-$50 depending on size. Dough bowl made of cherry. Photo courtesy of Elkland Handwerke. DOUGH BOWLS You could let your bread dough rise in any kind of bowl, but there’s something rewarding about choosing one of Tom’s handcrafted dough bowl instead. Made from a single chunk of maple, oak, walnut, poplar, cherry, or other hardwoods, each is different because he considers the grains, knots, and other characteristics as he shapes it. On non-baking days, leave your artisan bowl out as a conversation starter. Price range: about $28-$100. Thick hardwood cutting boards look good and leave plenty of room for knuckles above kitchen counters. Photo by Bakery Boy. CUTTING BOARDS You probably already have several utilitarian boards, but these thick slabs add something special to chopping chores. Tom cuts them thicker than most for a reason. 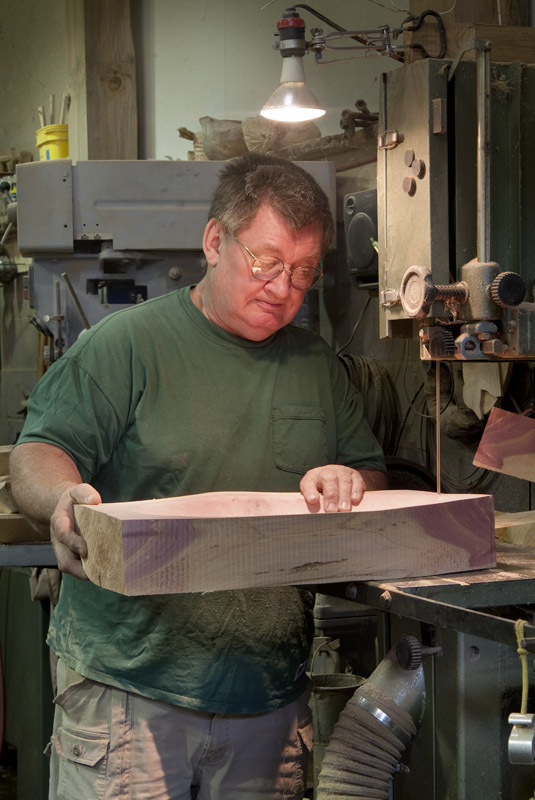 “Think about how many times you’ve hit your knuckles on the counter while cutting on a board that’s too shallow for the knife handle you’re gripping,” Tom says. 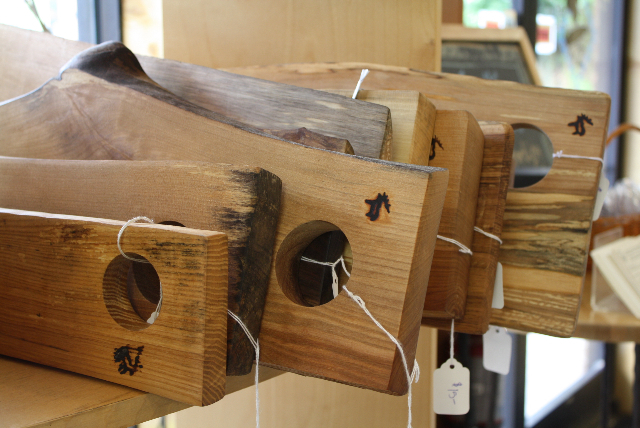 “My boards are several inches thick so when you’re chopping there’s room for your fingers.” Price range: $12-$32. Each Elkland Handwerke creation has an elk shape burned in wood or chiseled in stone, a tribute to the former Elkland Elementary where Tom lives and works. 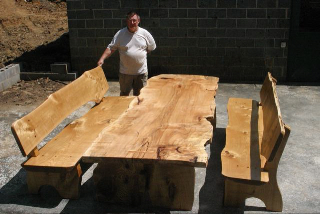 That's Tom with some of his heftier woodwork. Leftover scraps become household items. Photo courtesy of Elkland Handwerke. WHERE TO FIND Tom’s work goes as fast as he can make it, so truth is there’s not a large supply on hand anywhere. Here are a few promising places to look. Elkland Handwerke – Buy direct from the source in Tom’s studio-gallery; 10279 Three Top Road, Todd, NC 28684; www.elkland.com; 336-877-5016; elkland@elkland.com. Fall Creek Woods – Tom’s friends Paul and Beth Bloedel run this online woodwork shop; 2599 Fall Creek Road, Purlear, NC 28665; www.fallcreekwoodsnc.com; 336-973-5308; info@fallcreekwoodsnc.com. Todd Mercantile & Bakery – If there are more pieces here than elsewhere it’s because owner Emilie Enzmann, Tom’s feisty sister-in-law (who nicknames her place the Todd Mahal), pulls strings; 3899 Todd Railroad Grade Road, Todd, NC 28684; toddmahalbakery.wordpress.com; 336-877-5401; emyenz@yahoo.com. Stick Boy Bread Co. – This is where I first found Tom’s peels and cutting boards, an appropriate setting because they make terrific baked goods (see the Stick Boy article on the Bakery Boy Blog); 345 Hardin Street, Boone, NC 28607; www.stickboybread.com; 828-268-9900; info@stickboybread.com. The Shoppes of Farmers Hardware – Elkland Handwerke joins other crafts at this market in a former hardware store; 661 West King Street, Boone, NC 28607; 828-264-8801; shoppesatfarmers@bellsouth.net. Watauga County Farmers’ Market – Saturday mornings May-October in the parking lot for the outdoor drama Horn in the West (about wilderness pioneers and the American Revolution); 591 Horn in the West Drive, Boone, NC 28607; www.wataugacountyfarmersmarket.org; 828-355-4918; info@wcfm.info. Ashe County Farmers’ Market – Saturday mornings April-October on the Backstreet in downtown West Jefferson, NC; www.ashefarmersmarket.com; info@ashefarmersmarket.com. AREA INFO Boone Visitors Center, Boone Chamber of Commerce, Visit North Carolina. SPECIAL THANKS South Florida-based photographer Robert Stein of Robert Stein Architectural Photography (www.robertsteinphotography.com) contributed the image of Tom Sternal working on a dough bowl. 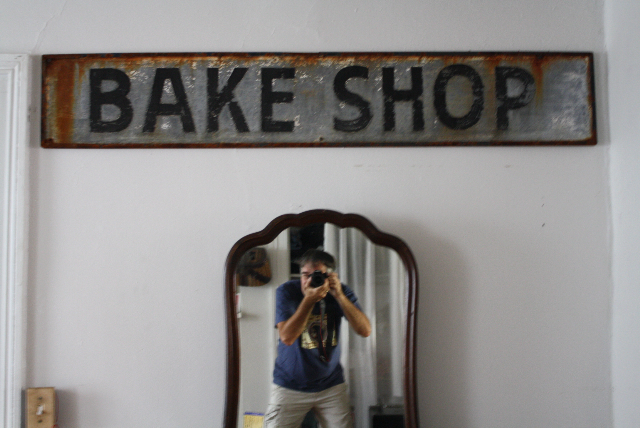 This rusty old bake shop sign marked my family’s bakery for generations. So where is it now? I must have passed under that rusty and dented old bake shop sign a million times, starting from before it got quite so rusty and dented and old. It was mounted above the back door of my family’s Dutchess Bakery in Charleston, West Virginia. It faced an alley where delivery trucks idled while dropping off flour, sugar, salt, and other ingredients or picking up fresh breads, cakes, donuts, and cookies. 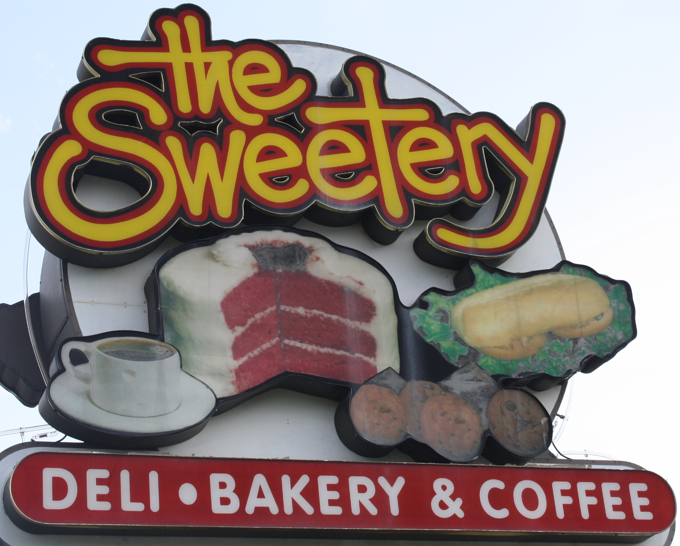 That sign hung for decades in silent witness as an endless parade of bakery employees, friends, night-shift cops, salesmen, and miscellaneous characters came and went. At the time I probably didn’t notice it much. I didn’t need a sign to tell me where I went nearly every day of my life. Only when it disappeared, leaving a rectangle of paint faded to a different shade, did I suddenly feel an urgent need to see that familiar heirloom again. Had it been stolen, I wondered? Did someone sneak it to a pawnshop for quick cash or slip it to an antiques dealer with a made-up story about its origins? Would it turn up as rustic décor in some themed restaurant? Had my brother Ed, who runs the bakery these days, stashed it away to protect it from thieves? I should have asked him directly, but because I’m the brother who left the business to pursue a writing career, I really don’t have as strong a claim to such keepsakes and didn’t want to appear covetous. Two years after realizing how much I missed that rust-pocked bit of nostalgia, I found it, and I believe it’s in a good place. I was in New York City visiting bakeries worth featuring on this website, and I dropped in on my nephew Nick, the younger son of my brother the baker. He grew up working in the same bakery as me and probably passed under that battered and weathered sign just as often as I did. Self portrait with family heirloom. Photo by Bakery Boy. Nick is an architect now working to preserve the grand and venerable Park Avenue Armory built in the 1870s near Central Park. He has a keen eye, an artistic style, and a genuine appreciation for history, including our family’s history. A newlywed living in a basement apartment, he has the sign, a gift from his father, mounted above a bedroom dresser and mirror, where he no doubt sees it every day. I’m glad that rusty old bake shop sign is still in the family and watching over a flesh-and-blood direct descendant of our scattered bakery clan. I’m especially glad I once again know where to find it—so every now and then I can go enjoy a memory-stirring glimpse. 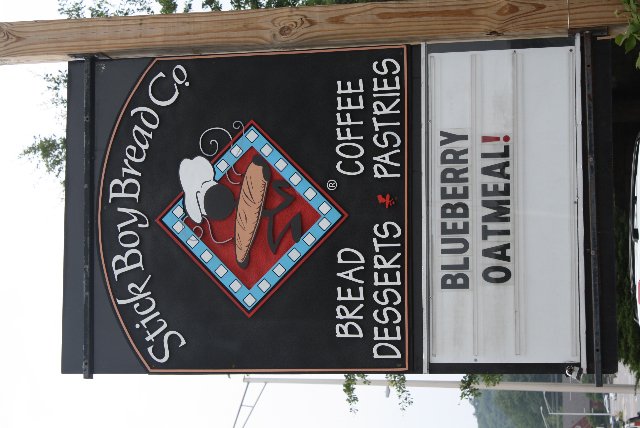 For its impressive baked goods, Stick Boy belongs on any bakery fan’s must-try list, even if the name begs explanation. 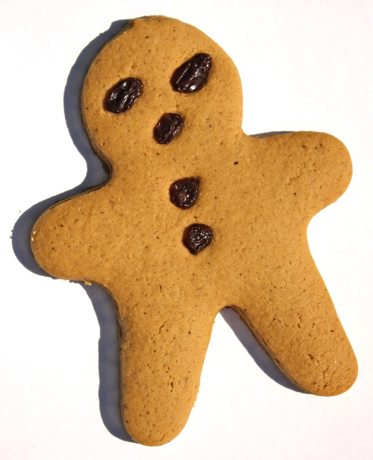 Thin bakery owner Carson Coatney often gets mistaken for Stick Boy. 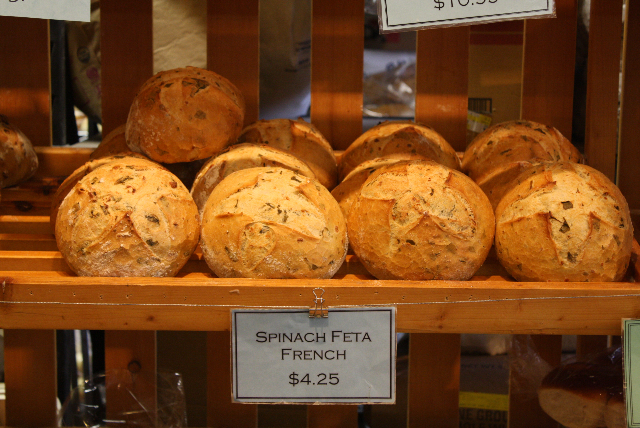 Stick Boy breads include crusty, aromatic loaves, often with inventive ingredients. Photos by Bakery Boy. 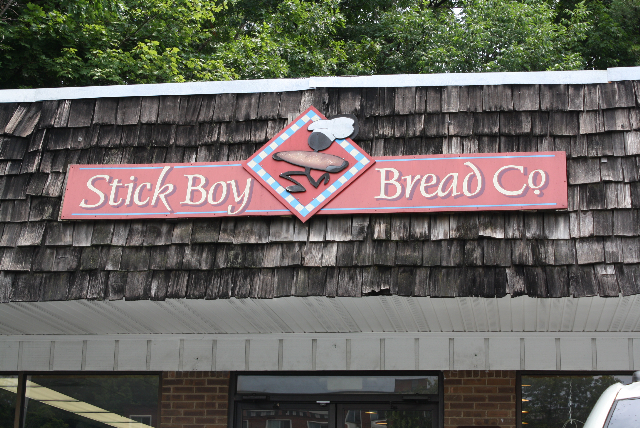 With the name Stick Boy Bread Co., I half expected its owner to be skinny. Or maybe, I thought, the menu will involve baguettes (bread “sticks”) and not much else. It turns out Carson Coatney is indeed a thin man and yes he makes some lovely baguettes, but that’s not where the name comes from and certainly not the only thing he makes. 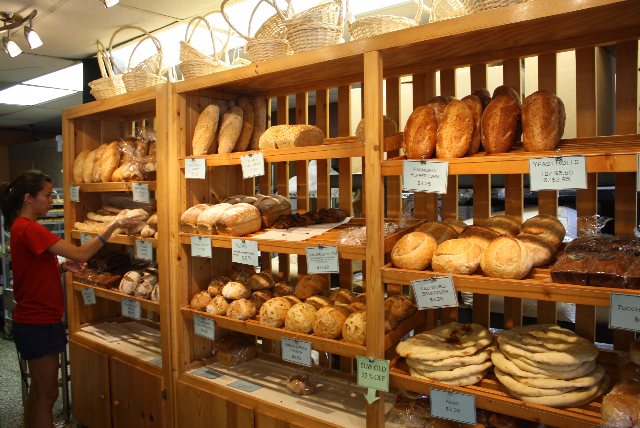 A few minutes into my first visit to the Boone, North Carolina, establishment it quickly became one of my favorite bakeries ever, both for the variety offered and the energetic attitude. “It happens all the time, people thinking Stick Boy refers to me,” says Carson, co-owner with his wife, Mindy. “I hope the real story doesn’t disappoint you.” In short, as they prepared to open in 2001, a friend in Virginia spotted an apparent joke of a sign stuck to a utility pole and sporting the words “Lost—Stick Boy,” plus a hand-drawn stick figure and a fake phone number. She laughed, told them about it, and suggested it as a bakery name. Initially they scoffed, but the idea grew on them. 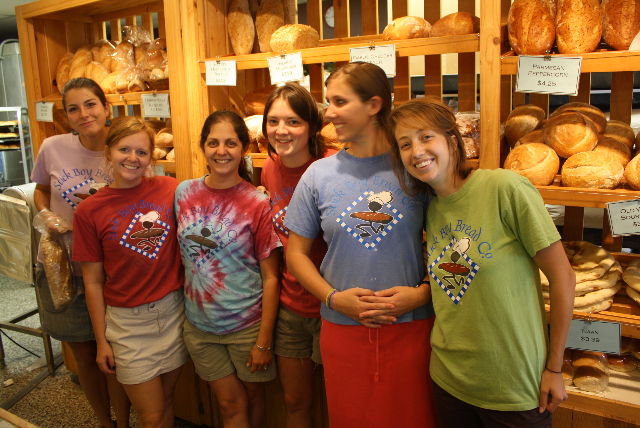 Mindy’s artistic aunt, Suzie Sadak, designed a logo showing a chef’s-hat-wearing stick boy running with a loaf of bread, and soon the couple’s bakery was off and running too. 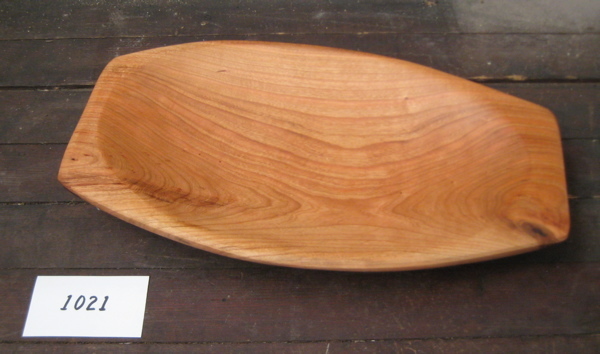 A local woodworker crafts baker's peels like this, for sale at Stick Boy. SO MANY CHOICES Keep your head on a swivel at Stick Boy, because options abound. 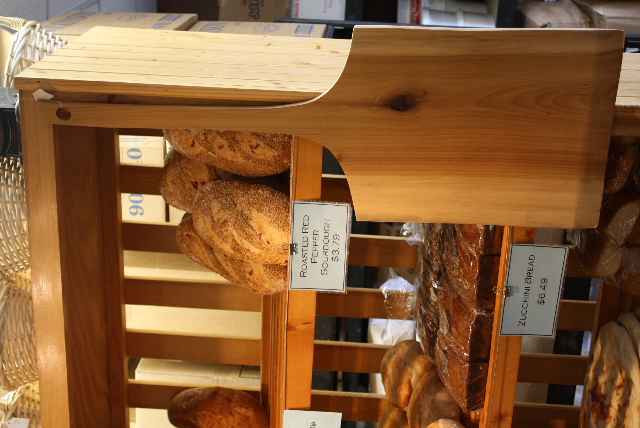 A wall of shelves holds hefty, aromatic, artisan loaves—crusty outside, softer but firmly textured inside—ranging from Spinach Feta and Roasted Red Pepper Sourdough to Italian Ciabatta, Honey Wheat, Organic Whole Wheat Multigrain, Organic Spelt with Raisins, Cranberry Pecan French, Rustic Apple, Pumpkin, Fig Walnut Wheat, Kalamata Olive, Blueberry Oatmeal, and others. Showcases teem with fruit pies, carrot cakes, chocolate tortes, scones, cookies, and amazing sticky buns loaded with cinnamon, raisins, and walnuts. A hot espresso bar and a cool smoothie station diversify the offerings. 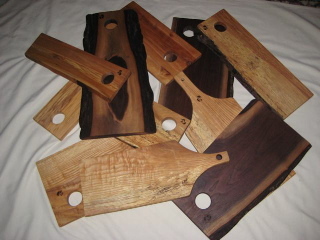 There are also beautifully handcrafted cutting boards and baker’s peels (those flat shovel-like tools used to move hot goodies around) made from fallen trees in the Blue Ridge Mountains at a nearby woodwork studio called Elkland Handwerke (see more at Fall Creek Woods). 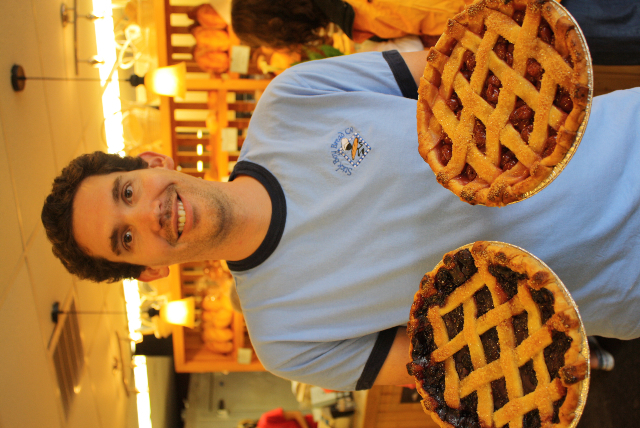 "Blueberries and cherries for our pies come from from nearby orchards," Carson says. HUMBLE BEGINNINGS Carson grew up in western Kentucky, studied economics and chemistry at Duke University in Durham, North Carolina, and frequented Boone, where he met and married Mindy, a Boone native. 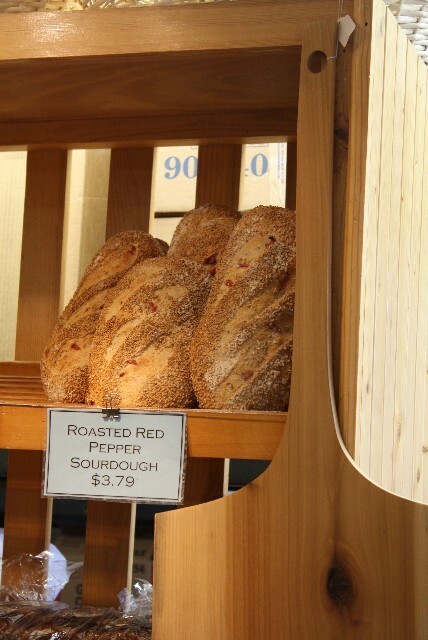 “We had the idea to start a bakery before we knew anything about baking,” Carson says. Pie time at Stick Boy. Current and former Appalachian State University students make up much of the Stick Boy staff. They hired a friend, then a relative, and then a succession of enthusiastic students from Appalachian State University located across the street. Mindy is at home more now that they have three sons (ages 8, 6, and 4), but remains integral to the operation. 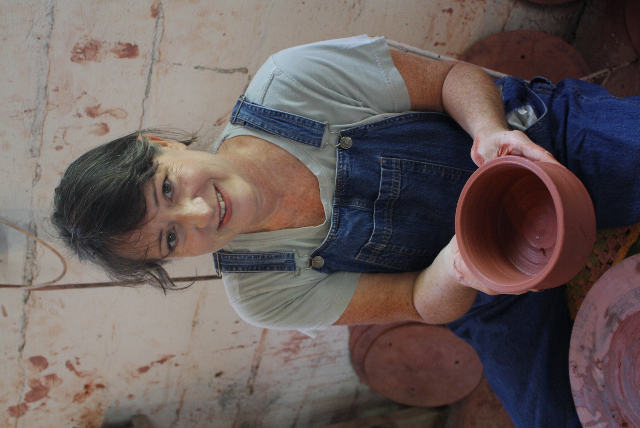 Potter Tena Payne of Earthborn Studios makes gorgeous stoneware pots perfect for baking cobblers and pies. My 8-inch "Baker," shown here empty and later with a peach cobbler cooling. Photos by Bakery Boy. 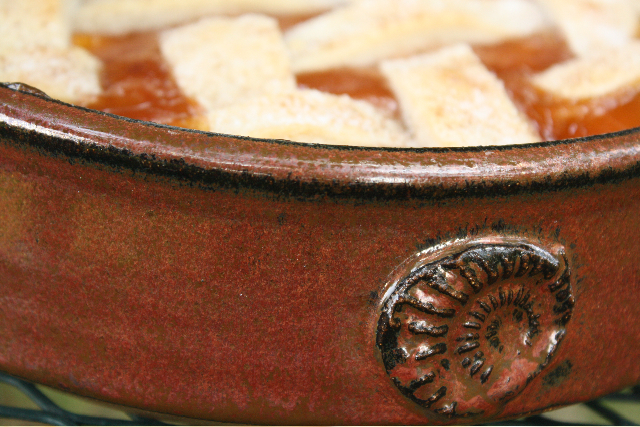 I’ve found the perfect pots for baking cobbler, and they’re things of beauty even when not in use. Potter Tena Payne of Earthborn Studios in Leeds, Alabama, creates the handmade stoneware pieces in five sizes and calls them simply “Bakers.” My 8-inch version (see photos) is glazed a brick-like reddish-brown outside and a softly swirling hazel-green inside. A chart below depicts some other available colors. 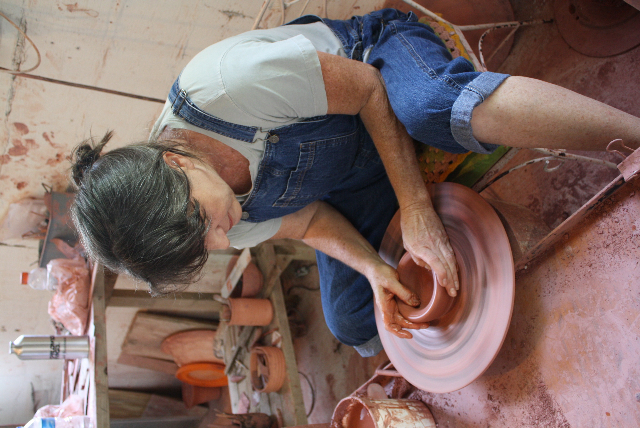 Tena Payne at her potter's wheel. FUNCTION & ART I’d been looking to replace the mundane glass pieces I’ve used for years, a 9-inch round pie pan and an 11- x 7-inch rectangular lasagna dish. I wanted something functional but also presentable. Then I ran into Tena, a phenomenal potter whose earth-toned, no-two-alike dinnerware reaches tables at some very fine restaurants. Her sturdy plates, bowls, platters, mugs, trays, and other serving pieces grace gourmet dining rooms at the Bellagio Resort & Casino and the Mandarin Oriental Hotel in Las Vegas, Caesar’s Palace in Atlantic City, Sushi Samba in Miami, Beau Rivage Resort & Casino in Biloxi, Mississippi, Palmetto Bluff Resort in Bluffton, South Carolina, and elsewhere. My pot functions well as a baking pan and looks centerpiece-good even when it's not in use. “As an artisan, I enjoy the challenge of blending art with the required function of each piece,” she says. GET ONE At least 100 galleries and specialty shops in more than 30 states carry Earthborn Studios pieces. Tena also ships directly from her studio near Birmingham. Click here for a list of retailers or here to order directly from Tena. Prices below don’t include 15% shipping. Wholesale rates are available for larger quantities. 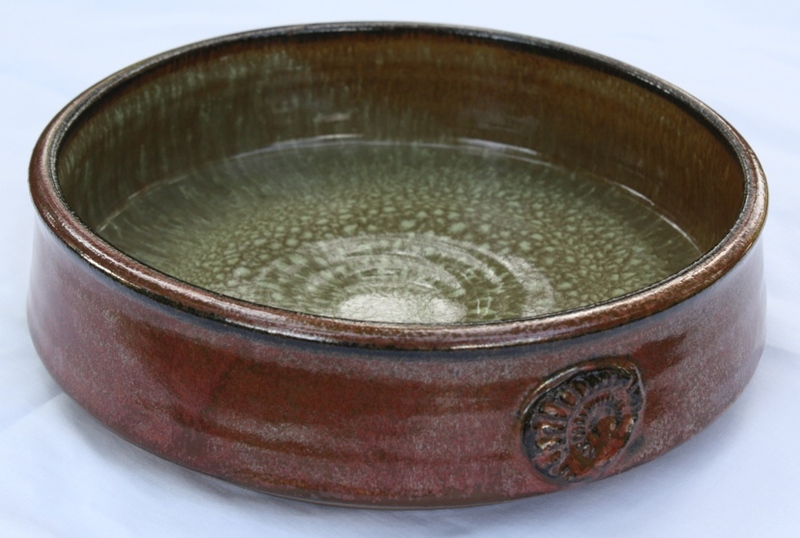 Earthborn's dynamic glazes vary from piece to piece and from one firing to another. Here are a few favorites. Image courtesy of Earthborn Studios. The Huck Finn look goes well with Tena's hands-in-the-clay lifestyle. INFO Earthborn Studios, 7575 Parkway Drive, Leeds, AL 35094; www.earthbornpottery.net; 205-702-7055; email earthbornpottery@yahoo.com. A food columnist’s tasty and detailed ode to cakes. Cake bakers have another reason to live, as if they need one more. Let’s face it: Cake bakers already have plenty of friends and admirers. Whether they’re making a single treat for the family table, dozens for a banquet hall, or truckloads for supermarkets, their sweet creations brighten celebrations and make people happy. 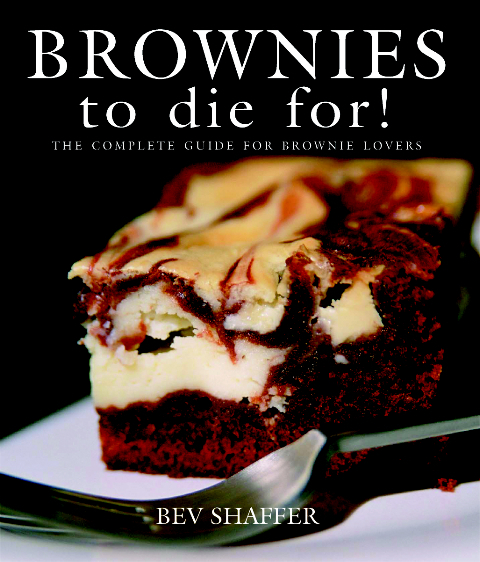 Now they also have Bev Shaffer’s inspiring and thorough ode to the genre, Cakes to Die For! (Pelican Publishing Company, $26.95). The Ohio-based chef, author, and culinary instructor is known for her long-running food column “Ask Bev” in the Cleveland Plain Dealer, her functional-fun column “Gadget Freak” in Northern Ohio Live Magazine, her radio spots broadcast on Akron’s WAKR, and her many appearances on Cleveland affiliates of major TV networks. She has developed more than 9,000 recipes and counting. 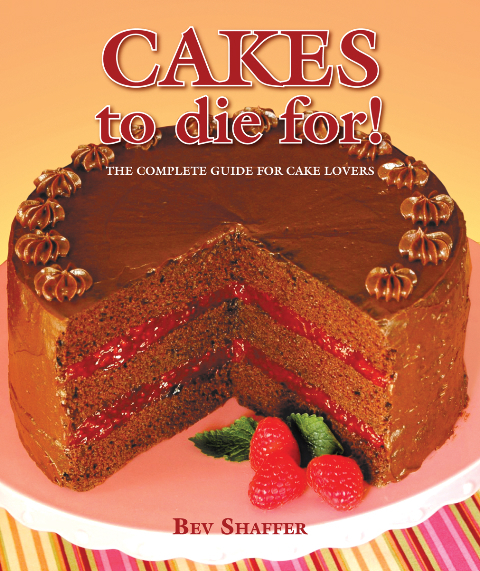 In Cakes to Die For!, a 288-page hardback, she shares 175 of them, all for cakes. 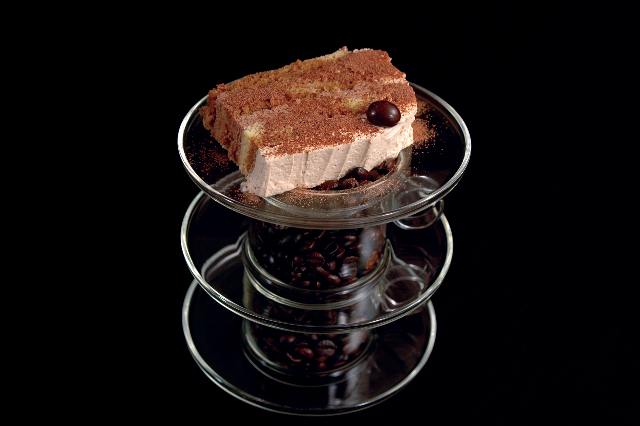 Crunch of Praline Torte with Eggnog Cream. Photos by John Shaffer (Bev's husband). It opens with the crowd-pleasing Moist Dark Chocolate Mocha Cake with Raspberry Filling, her “go-to” cake when she needs something “seductive,” she says. It ends with Bev’s Butterscotch Filling, about which she facetiously claims, “you could slather this between two pieces of cardboard and people would rave about it.” Between these appear scores of cheesecakes, cupcakes, “flipped over” cakes (her term for up-side-downs), “fancy-schmancy cakes” (which take more work but promise impressive results), and more. Photography by Bev’s husband, John Shaffer, show many of the cakes in mouthwatering detail. TIPS GALORE Useful tips are sprinkled throughout. Some explain the finer points of techniques like “cutting in the butter” or “folding ingredients” together. Others cause that light-bulb-above-the-head reaction with their but-of-course common sense. I like how she places tips labeled “a slice of advice” in the margins close to where they’re most needed. For example, next to the recipe for Deep Dark Chocolate Soufflé Cake with Roasted Pear Cream she writes: “When you draw your clean finger across the back of a metal spoon dipped in the custard mixture, and it leaves a path, it is ready.” I can visualize that perfectly now. To avoid spilling batter down the hole in a tube or Bundt pan, cover the hole with a paper cup while filling the pan. Cool a cake completely before frosting. Dust off any loose crumbs gently with a soft-bristled brush. 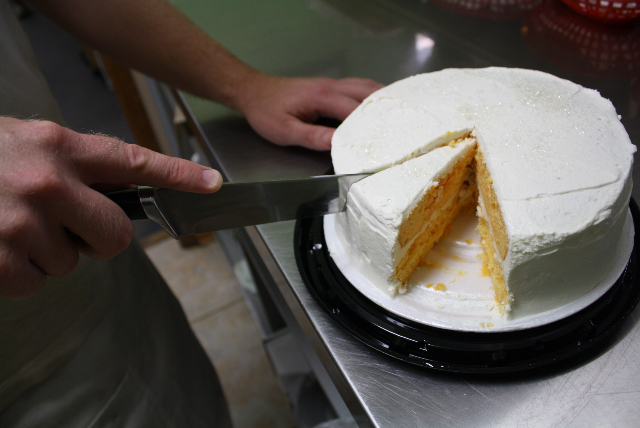 Freeze layers for several hours or overnight before frosting…which helps the frosting adhere better. Just before using refrigerated nuts, toast them over low heat in a dry skillet to brighten their flavor. Can’t find cranberry preserves [for the Pumpkin Patch Cranberry “Flipped Over” Cake]? Pomegranate jelly is a perfect substitute. Although come to think of it, if I can’t find everyday cranberry at my grocery, I probably won’t find more-exotic pomegranate either! ALSO BY BEV Like Cakes to Die For! (May 2010), Bev’s earlier books, Brownies to Die For! 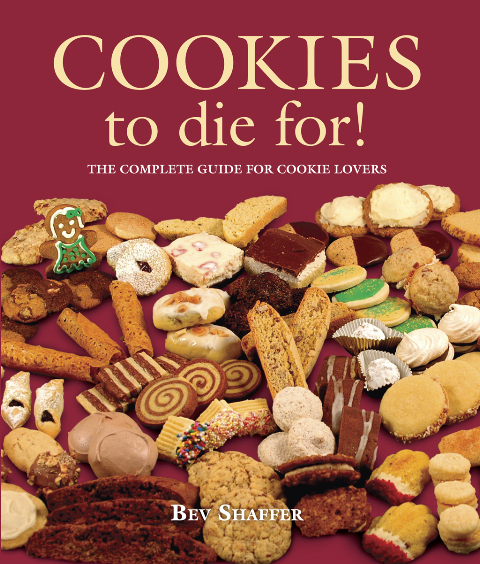 (March 2006), Cookies to Die For! (February 2009), and Mustard Seed Market Cafe Natural Foods Cookbook (September 2007) are also available from Pelican Publishing Company of Gretna, Louisiana; www.pelicanpub.com, 504-368-1175. For more about Bev see www.bevshaffer.com. BEV’S MUST-HAVES FOR A CAKE BAKER’S PANTRY I found this helpful. Maybe you will too. 9 – Butter, unsalted please! 11 – Eggs, large please! 12 – Chocolate: bittersweet, semisweet, milk, white, and unsweetened cocoa power—only the very best will do! 13 – Vanilla extract, pure please!